Roma is the new porcelain stoneware floor tile and white body wall tile collection that reinterprets the embracing charm of marble and travertine in a contemporary key. Not only the range but even its name, Roma, pays homage to the great beauty and Italian style that is loved throughout the world. 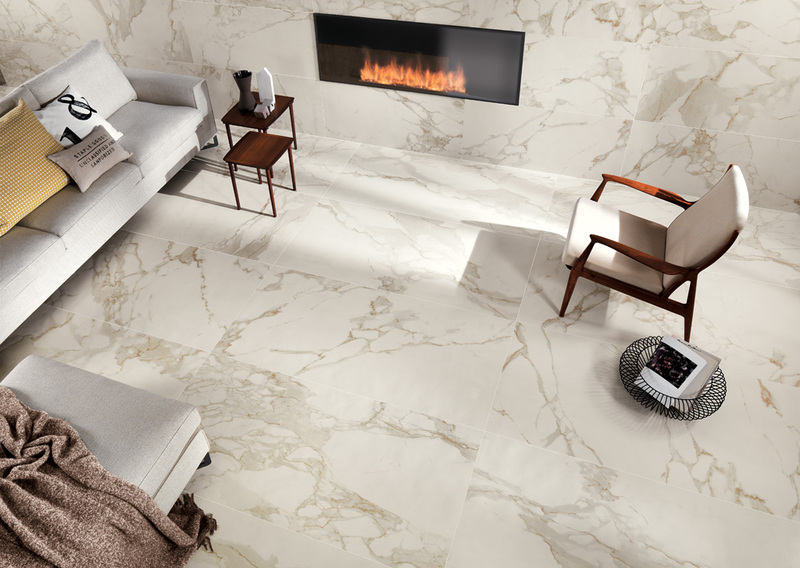 The sophisticated grains of the marble help to create elegant settings, exclusive atmospheres with timeless charm. A sophisticated and seductive range of unique pieces with a strong personality, ideal for both residential and contract use. Roma is a complete project, an extremely articulated collection in terms of size, shape, colours, decorations and surfaces, which sums up the design skills and will to talk to the market with a cutting-edge designer range that perfectly responds to the different needs of a constantly evolving market. 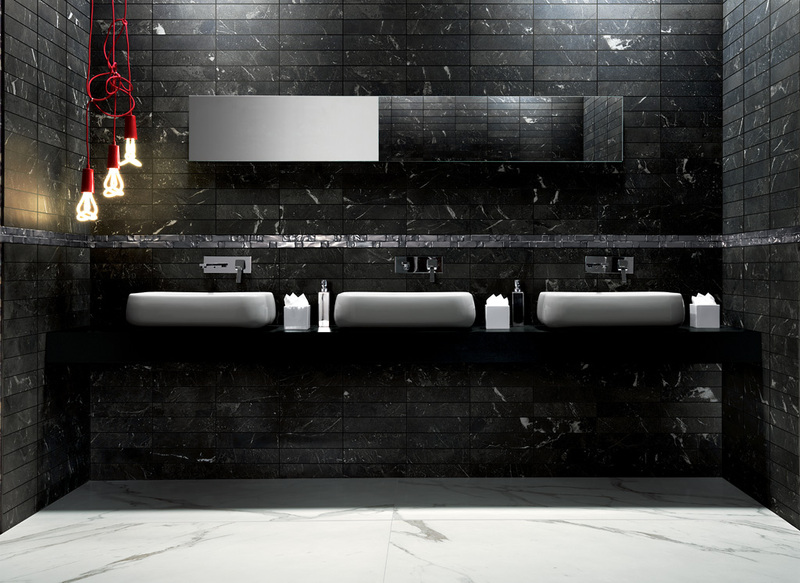 The absolute star of this new collection is matter: managing to capture and reproduce the extreme realism and naturalness of the special colours and appearance of stone and marble, interpreting a selection of precious, fashionable marbles in six different shades: Grafite, Statuario, Calacatta, Imperiale, Pietra and Travertino. The result is a fine balance between soft surfaces and the natural effect of matter. 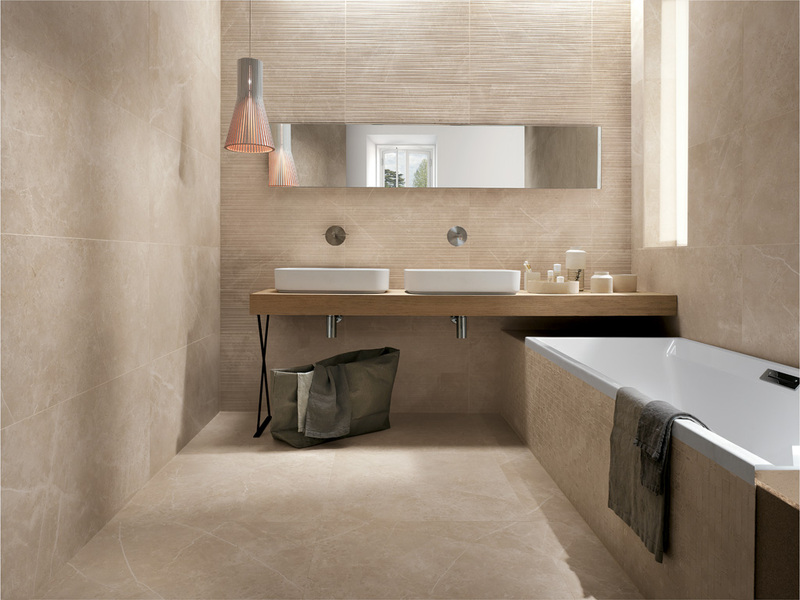 The porcelain stoneware floor tiles run from large rectified sizes – 75×150, 75×75, 60×60 and 30×60 cm (available in both Matt and the unique Lux brushed versions), to small sizes with a craft flavour, 20×20, 7.5×30 cm and hexagon 21.6×25 cm (all with Matt finish). The white body wall tiles, with Matt finish, come in size 25×75 cm and in the brand new extra-size 50×110 cm rectified, an absolute first for the market. 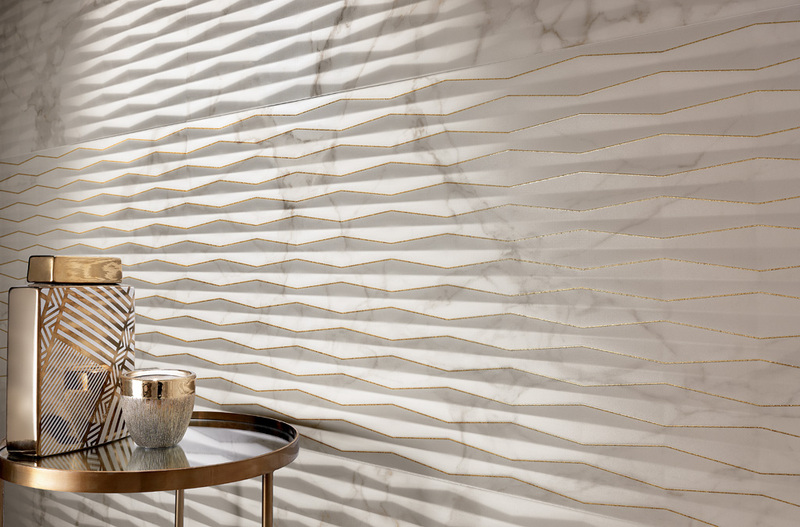 The feature wall tiling in the collection is available in both sizes and with two 3D surface finishes: Filo, reproducing an elegant reed pattern typical of contemporary marble processing and Fold, a charming structure creating prisms of light. The range also includes a rich variety of inserts and mosaics for both floor and wall. Made from porcelain stoneware, the range of decorations Roma Deco in the brand new size 20×20 cm and the third-firing insert Tracce again in size 20×20 cm. For the hexagonal size, a decoration is available with an impressive graphic detail. The pieces Righe, Incroci and Greca Mosaics used to enhance floors with modern two-tone patterns. The range is completed by some special pieces – Skirting, Stair tiles and wood-effect Rhombus, ideal for creating a perfect finish. 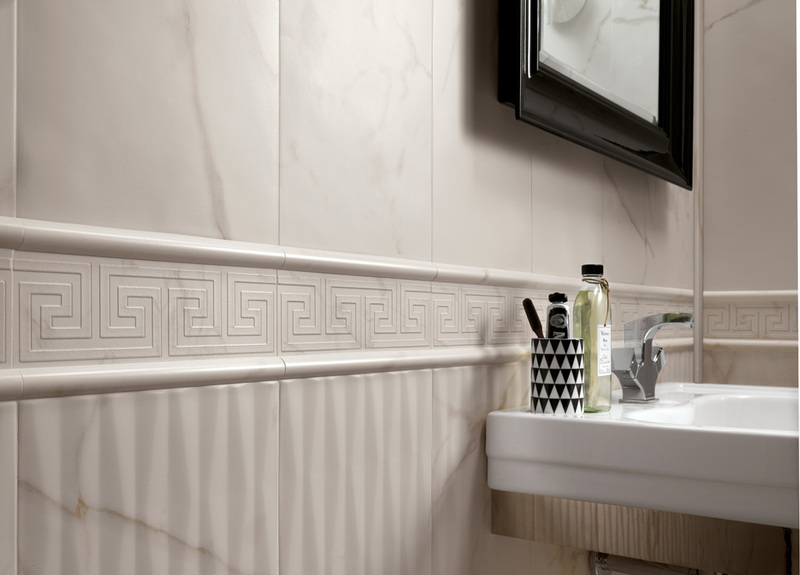 And to enhance the walls, on the other hand, why not try some elements with a more classic flavour such as the Classic Insert, a delicate weave of ton-sur-ton acanthus leaves, and the Greca Listello, with the typical pattern of marble listels. And for wall tiling with more character, the 50x110cm rectified Dark Insert, with a modern damask flavour and the Raku Listello, made from precious metallic tesserae. Roma also has a wide range of mosaics: the unique Round Mosaic (29.5×32.5cm), which stands out for its round tesserae; Brick Mosaic (30x30cm) with small rectangular tesserae with irregular edges and Micro Mosaic: square micro tesserae, again with an irregular edge. The Roma Natura Mosaic comes with three-dimensional square tesserae with an irregular surface, creating a vibrantly soft effect. 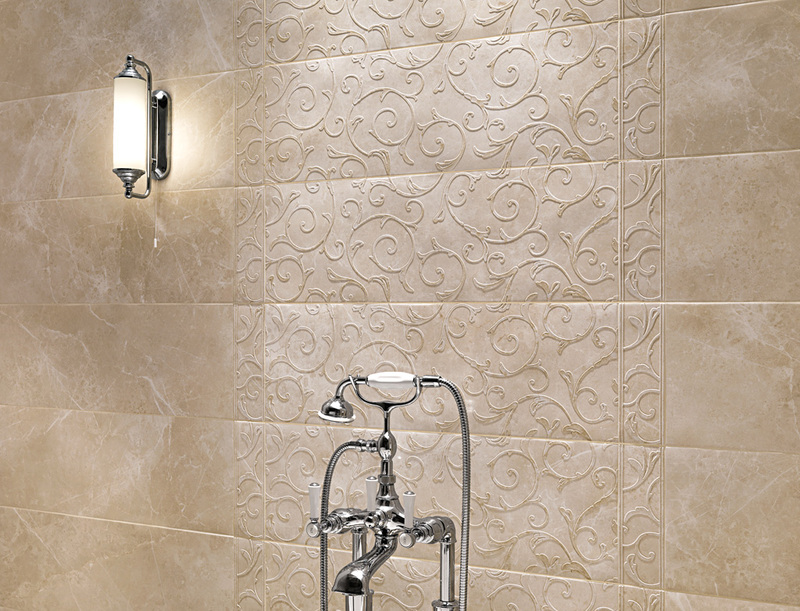 Also in the range, the Classic Mosaic with square tesserae, made precious by satin-finished textured effects.